The preparatory team offer the three-day program for those who look forward to the event of beatification, so-called The weekend of beatification. 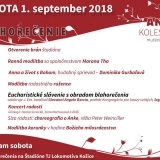 10:30 Glorious Eucharistic celebration in the St. Elizabeth Cathedral in Košice connected with the delivery of blessed Anna Kolesárová´s relics.Celebrant Mons. Bernard Bober, Archbishop of Košice – metropolitan.At the end of the mass the preparatory year will be declared for the 400th anniversary of the martyr´s death of the Holy Martyrs of Košice. A glorious celebration in Vysoká nad Uhom with the deposition of the reliquary of blessed Anna Kolesárová will celebrate Mons. 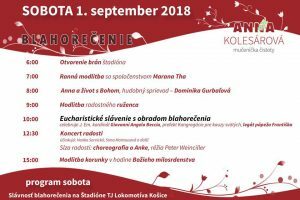 Bernard Bober, Archbishop of Kosice – metropolitan on Sunday 30 September 2018 with the beginning at 10:00 in the church of the Seventh swords Virgin Mary.